A writing career is fraught with peril. Here is your complete guide to writer health risks and remedies, with real-life examples and links to scientific sources. Everybody knows the health risks involved in being a fireman – smoke inhalation, burning to death, and being forced to pose for a beefcake calendar. Everybody knows the health risks involved in being a policeman – dying from bullet wounds in a shootout with bad guys, dying in a flaming crash while chasing the bad guys through alleyways and gridlock, and clogged arteries from too many donuts. I warn you in advance that this post is much longer than I usually write, but I have also linked to a number of other articles and scientific studies – otherwise this post would have turned out to be a book. If you’ve been hiding under a rock recently, you might have missed the most trendy health risk that has just been “discovered”. Sitting for too many hours in a day, particularly for too many consecutive hours is slowly killing us all off. The ill effects of too much sitting include some of the worst health villains of our day – obesity, cancer, diabetes, cardiovascular disease, dementia, “all-cause mortality” (another term for death by whatever means). A meta study published in the Annals of Internal Medicine earlier this year concluded that: “Prolonged sedentary time was independently associated with deleterious health outcomes regardless of physical activity.” In other words, you can’t spend ten hours writing and then make up for the sedentary time by going to the gym for an hour. You should be moving over the course of the day. I tend to tap my foot a lot. That’s better than nothing, I suppose, but hardly a solution. Best practice is to get up and do some moderately vigorous physical activity for a few minutes every half hour. I often run up and down the stairs, but I also often forget to move at all. Pardon me while I take a quick break to walk around a bit. Like our bodies, our eyes are meant to keep moving. When they don’t, we have a problem. All that staring at the brightly lit screen can also lead to migraines, blurred vision and other eye issues. Studies have linked staring at computer screens all day to an increased risk of glaucoma. Apparently we blink only half as often in front of a computer screen as we “normally” do. This happens because we squint, yes, even just a little without realizing it. This creates “dry eye” which might or might not also contribute to eye strain. Variety of direction, to the left and right, up and down. Variety of focal distance, looking at both near and far objects. I am blessed to be a two-finger typist. Yes, that means that I might type slower than some people (although, I am pretty fast for two fingers), but it means that I look back and forth from screen to keyboard, so my eyeballs move at least up-and-down and I change my focal distance a bit and, of course, the lighting changes frequently. The best thing you can do for your eyes is to purposefully look up, to the right and to the left into the distance every few minutes. You might want to follow the 20-20-20 rule, every 20 minutes staring at something at least 20 feet away for at least 20 seconds. Looking away also helps your neck. If you take the same moment to roll your shoulders and stretch your arms up and back and forward and around, you’ll also help the general physical tension in your body. Or get a cat; they sometimes force you to look at them every now and then. Kids do that, too. Or try working in a café, where you can’t help but look up as people pass by. Don’t be shy to place a sticky note that says “Blink!” Reducing glare and increasing font size also tend to reduce the amount of squinting and increase the amount of blinking. Keeping your computer screen a couple feet from your eyes is also recommended, partly to avoid focusing too closely for too long, and partly because you are more likely to also look beyond the screen, or even closer at your own hands, from time to time. Of course, if you take a few minutes to engage in physical activity for your whole body, this will also benefit your eyes, because that will also take them away from the computer screen. OK, time for another break. I’ll be back soon to write the next section. Is it any wonder that people get headaches staring at a computer screen? You can sit for hours without moving your neck. Your eyes are riveted on the screen. You are working away – you are in flow! – with full concentration of both mind and body as the words flow from your brain through your finger tips to the screen. Everything about you and your body is tense. This will be a short section – no need even for me to take a break at the end. The remedies are already explored above. Take frequent breaks. Give your body a shakedown and a workout. Give your eyes variety in distance, lighting and direction. Roll your shoulders and stretch your arms in all directions. If headaches persist, it might be more serious. Perhaps you need a different eyewear prescription. Or perhaps there is something not related to writing. Backache is the result of hunching over your keyboard and remaining in that position for many hours of the day. As with tension headaches, this is a pain you can deal with in large part by moving about more frequently, and particularly by rolling your shoulders and stretching. Checking your posture while you are typing will also have obvious benefits in warding off backache. In fact, your tension headaches might be caused by poor posture. You might also want to check your posture at other times, including when watching TV, eating and while standing. Yes, back pain due to poor posture could have nothing to do with your writing career. Best practice is to place your screen just below eye level, so that your neck bends downward just slightly. A few additional remedies include giving yourself a neck and upper back massage and buying an ergonomic chair. I find that when I sit back in my chair, more for social media activities and networking than for writing, I tend to slouch. But when I sit on the edge of my seat, as I am doing now to write, I generally have much better posture. Here is a piece of advice I don’t think you’ll read elsewhere. Write on a desktop, not on a laptop. Why? For best posture, you need the keyboard right in front of your body, to avoid slouching shoulders as you reach. But for best eye distance, you want the screen to be a couple feet away from your eyes. You can’t have it both ways on a laptop; you can on a desktop. Dr. Steve Knighton, an Oakville, Ontario, based chiropractor has a number of tips on posture and equipment usage. It seems he wants me to “Don’t sit on your damn leg, keep both your feet on the ground.” Yeah, right! Like that’s going to happen. Clayton Scott, Associate Professor of Electrical Engineering and Computer Science at the University of Michigan offers a lot of good advice about posture, seating and use of keyboard, mouse and screen. And would you be surprised that his top tip is to TAKE BREAKS! His capitalization. His exclamation mark. His advice, however, is not specific to backaches, but rather to repetitive strain injury. Many writers feel pain in their hands, wrists and arms from overuse. If you make the same precise movements repeatedly, you run the risk of causing damage to various soft tissues, including your muscles, your nerves and your tendons. The hands and wrists are most vulnerable to this. Among the conditions that fall into this category are bursitis, writer’s cramp and tendonitis. Writers and data entry clerks are most at risk, due to the nature of their tasks. If you have been feeling a tingling or numbness in your hands or wrists, chances are you have carpal tunnel syndrome. Left untreated, it will likely get worse, with piercing pain shooting up your arm. It should by now go without saying that taking frequent breaks will help. Any break from the repetition is good. Of course, if you massage the hands and wrists or do other things with your hands – different movements – that makes the break even more beneficial. Twist and roll your wrists to make sure blood flows everywhere and to keep the muscles supple. Adjusting your posture to reduce the strain on your wrists is also helpful. Adjusting her posture is something Shobha Ponnappa was advised to do for her aching neck-shoulder area. The pain, which was diagnosed as bursitis doesn’t go away. Posture changes and painkillers don’t work, and the longer she works at her laptop, the worse the pain gets. “I am now resigned to the fact that writing is a pain in the neck, but if it has to be done, it has to be done!” she says. Try also to use as little force as possible when hitting the mouse and keyboard. And keep your hands warm – my never ending challenge. Repetitive stress injuries don’t happen just in the hands and wrists, but also in the neck and shoulders. That is one more reason to take those breaks, roll the shoulders, stretch the arms in all directions and make sure to have good posture. One of the things I notice when I am in flow, whether writing or doing anything else, is that I want something quick to eat. I don’t want to spend ten minutes making a salad. I want to be back writing within seconds. The easy things to grab are usually the worst things to eat. To make matters worse, if you do things the really fast way, grabbing the bag of brownies or chips and just bring it over to your desk with you to munch on while you type, chances are that you will eat the entire bag, not just a “reasonable” quantity. If you do that with a bag of carrots, kudos to you, by the way. The solution is to plan your meals in advance, first thing in the morning or even the night before. By mentally focusing on the food without being distracted by the writing, you can better control your eating. And if you know you’ll get the munchies mid-afternoon, you can plan something less damaging than impulse binging on your mother-in-law’s banana bread sitting out on the counter screaming “Eat me! Eat me!” But that is, of course, just a hypothetical example – heh, heh. Did you know that writers are more prone to depression than normal people? Creative careers (artists, entertainers, writers) are among the top 10 careers with the most depressions. But writers tend to get lost in their craft and often immerse themselves in solitude longer than most other freelancers do. And like other freelancers, writers face the emotional challenges of dealing with client acquisition, demanding clients and some off-the-wall abusive or just-plain-crazy clients. Writers who are authors in their own right (as opposed to ghostwriters) also face the emotional upheaval of rejection letters from editors, agents and publishers and the naysaying from family and “friends” – you know, the maybe-it’s-time-you-got-yourself-a-real-job syndrome. “A large part of a writer’s success depends on how other people think of him or approve,” says Alan Manevitz, MD, a clinical psychiatrist in New York City, whose words could apply to any artist or entertainer, as well. In fact authors were found to be twice as likely to commit suicide as other people. Those rejection letters can really sting. Interestingly, the study also found that the close relatives of authors were overrepresented in schizophrenia, bipolar disorder, anorexia nervosa and autism. It seems that being a writer is contagious, after all. But how does this differ from the sculptor, the painter or the musician who has just completed a work? Here’s a useful bit of trivia. Did you know that a healthy diet and regular exercise often helps with depression? I know, I know, where have you heard that before? Dancers, musicians, sculptors, and even painters move around much more than writers do. Could this lack of physical activity be the biggest risk factor that writers face? Some writers can submerge themselves so deeply in their stories that they lose a sense of their own identity. This can sometimes be associated with depression, especially when their characters are going through bouts of suffering. According to Denise Mann, a writer with Everyday Health, “Being familiar with misery, pain, and suffering may guide the process for some writers. Yes, writers can write about suffering even if they don’t know it intimately, but some may feel that their work will lack authenticity if they haven’t experienced the same trials and tribulations as their characters on some level. One method of tempering both depression and identity loss is to be less isolated. This might be a challenge, but there are writers groups in every city, and you can create chat rooms on Skype to discuss ideas, talk shop and rant about whatever is driving you crazy. Many people around you will not understand most of your challenges as a writer; other writers will. Yes, and keep moving. Move your arms, your shoulders, your legs, your whole body. What is the Number One thing a #writer can do to stay healthy? Move! Do you have any stories of your own? Have you suffered from any of these conditions, or any others I might have left out? Please share your story below. Disclaimer: I made light of the risks of being a firefighter or a police officer. In no way do I mean to diminish either the amazing contribution they make to society or the tremendous and very real risks they face every day. I take my hat off to every one of them. Very nice, David and thanks for the mention. I learned a few things. I didn’t know that Hemingway wrote standing up. Knowing that makes it easier to do. My standing station has been frozen for several months so I’m sitting too much. Need to get it fixed asap. Epic post, David. More tips for your readers: I sit in front of three picture windows. As I am writing, my eyes move from the main monitor (as large as you can afford to ease eye strain) to my laptop (where email and my project list live) to a panoramic view of the countryside. The birds just outside my window; hummingbirds peeking in; the ducks playing in the water; newborn foals, burros or llamas grazing in the pasture – these all reduce stress and moving my eyes from near to far and between monitors reduces eye strain. Near my desk I have a small refrigerator, toaster oven and hotplate. I cook in large quantities and can quickly pop something into the toaster oven to reheat without losing my train of thought. Most days during the winter, I have a large crock pot full of grass-fed beef roast and organic veggies, Today I have chicken and winter squash soup in the crock pot. I drink a lot of Traditional Medicinals herbal teas both hot and cold. Cup and glass are both within reach and easily refilled. First thing in the morning I go outside and do some “chores” such as letting ducks out, washing and refilling waters, feeding various animals, collecting eggs, checking the mail, etc. Throughout the day I work for a while and then take a break to relax and eat while watching a video or to go outside and check on animals or do other quick chores. Freelance writing and small business consulting gives me the flexibility to live a healthier life. Far from the stresses of the city, i eat 100% organic, growing much of it myself and sourcing what I don’t have from local organic farms, berry fields, and online from specific small businesses that test their food. I also pick wild edibles. Moving around, clean water, and healthier nutrition are key to getting better instead of just older. You paint a lovely picture, Gail. I often get outside during the work day for a few minutes here and there, but I also often get so caught up in writing… oh, well. What a wonderful post it is! A very timely piece! and am sure this is going to be a viral one! No doubt, Health is an important factor in our life! and we need to give much attention to it otherwise we will suffer at a later stage. when coming to the injurious facts in relation to writers, their sitting comes in my mind first! Yes, sitting is smoking! It really kill us on a slow process. Sometime back I read an article on this line written by the comment Queen Harleena Singh in her pages AhaNOW. And she was talking about the dangers of continuous sitting! which we the bloggers can’t avoid! that time onwards i started practicing writing, reading while standing, and my desk top computer i adjusted to that level to stand and write, and i do still practice that at home after sitting 8 hours before the computers in office. Even sometimes i stand and do work with the computer in my office for this people around started laughing at and i just ignored and continue this even in office and at home! yes. moving around in between writing or reading after one hour or so also will do wonders! The wonderful tips you have presented it here is really worth practicing! Yes, the key word here is “MOVE” wonderfully coined it! Yes, we need to move, move and move, that will surely helps us to overcome such difficulties our writing career! Oh my,,, my fav writers like Ernest Hemingway, Charles Dickens, Virginia Woolf all are reported to also have written standing up! Their time i doubt they never used any computers, but still their continuous sittings might have given trouble to their health thus they practiced writing by standing! Wonderful information! Again I liked that 20-20-20 formula!! That is indeed a good idea to practice, I am going to practice that! Thanks for sharing that! Yes, Dave even to read this post i struggled a lot, and i do increase the font by using the Ctrl+ buttons! I am sure that will give a smooth read! The internal injury or the repetitive injury is also a serious things to taken care of! Oh my… altogether you presented a viral post here and a must read to all writers. especially the bloggers. I am bookmarking it for my further read, The connected internal links are really worth reading. though only few i visited in need to do it one by one to get more info on this line! Thank you so much Dave for this informative and timely post. Yes, this can be an eBook in itself. I read about this wonderful post at kingged and i dropped this comment there and i up-voted this post. Thanks again for sharing such a lot of information to your fellow bloggers! I am sharing it to all my social networks. Phil, I think your comment is almost as long as my post – and this might just be the longest post I have ever written. Yes, famous writers have written standing up, and I assume many non-famous ones. I know that when I am on the telephone, I think best walking. So I assume that is why some writers wrote standing up; they recognized that they think better that way. In fact I left out few more things i wanted to mention! Hey, today morning i applied some of the things you mentioned in this post! Hey I want to ask few pvt. questions, for which i am sending you a PM today. Hope you will find some time to clear those doubts! Hey Dave, I have written a small note about this post in my page with all due credit. Absolutely amazing! I laughed so hard in places but you are spot on about the trials and tribulations of being a writer (or any office worker prone to many hours at a computer for that matter!) I love that this article was fraught with humor, it made it a quick read despite the length! While I know that some of the health risks associated with being a writer are no laughing matter, you made the article informative enough for those unaware of the many issues that can come with this type of work and interesting enough to want to read to the end! This has to be one of my favorite excerpts: “My husband says it’s okay for me to write notes to my characters, as long as they don’t start writing notes to me.” I’ve always told people who embarrassingly mention that they must be going crazy because they are talking to themselves that they only have to worry if they start to answer back! Thank you for sharing this fun and informative post, keep up the great work! True story. Several years ago, my wife had to leave the kitchen because my daughter’s imaginary friend Lulu was sitting in her chair. We might all be going crazy. Funny you wrote an article about the health risks of being a writer. I just got done doing my own piece on how working for a corporation is like being a slave. And in that piece I mentioned as one of my main points, “bad health”. Because like you said, you are sitting in a chair all day staring at a screen. And the human body is meant to move and be active while the eyes are actually wired to see long distances. Anyway, good piece as I think this is very true what you have stated in this article. 8:00AM to 5:00PM Monday to Friday is my regular job schedule working online, checking, responding and sending emails etc. after I go home around 6 or 7PM I go online and work again. “SITTING THROUGH THE DAY” gives me back pain and made me feel a little lethargic. I agree there is a risk as an online worker. We need to be healthy, eat well, drink more water, and excessive most especially. All in all, this is the best article about health tips for bloggers/online workers like me. “Twist and roll your wrists to make sure blood flows everywhere and to keep the muscles supple.” this is useful. Thanks for the tips! I will keep it and help myself. Awesome all in all! Yes, you so need to find a way to get moving during the day. It’s not as bad as the coal miners of olden days, but being chained to a desk all day is just no good. I am glad I came to land on your post. It honestly made my day. I know I can suffer from common disorders, sickness or injuries but I never thought it can be as serious as you said. I am surprised that writers who are working long hours in front of a computer can be twice more prone to developing depression than normal people. Headache, eyes strain and back pain can’t be avoided specially if you are working long hours without stretching your limbs. What I always do to stay healthy despite working long hours in front of the computer is that I try to do simple stretching every now and then during the course of the day. This is such a helpful article specially for writers like me. Thank you for sharing all these info with us. Gread post! My bad habit is getting ‘stuck’ in one (not particularly comfortable) position while being totally engrossed in what I’m doing. It’s only when I come to move that I realise I’ve locked up. Mary. I know that feeling! David, this is a wonderful post, and it really highlights so accurately the perils of being a writer. Some of the issues can be resolved, as I did last year, by using Dragon Naturally Speaking. 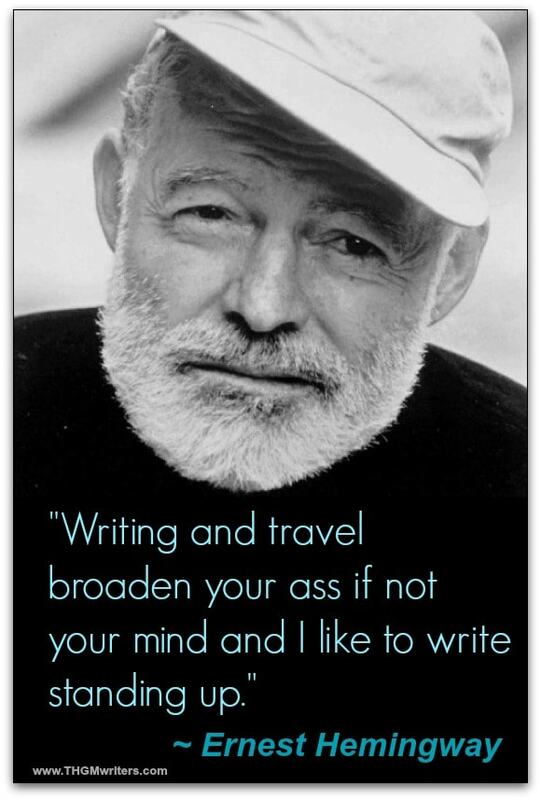 It takes a while to customise and get used to it, but hey, this way we can be just like Ernest Hemingway and stand up while we write. 🙂 Off to tweet!! Of course, I am a lazy idiot in the first place, so I get most of the above anyway! However, I have a few things that help me. To start with, the outside world is just outside my door, so I visit it frequently. To be honest it is a better place for inspiration than home, even when writing fantasy, so it is a must place to go to for any writer. I use thee great big monitors. 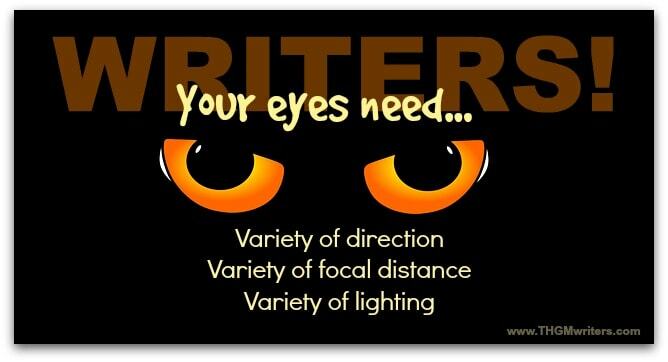 This means my field of vision changes continuously which gives the eyes a proper workout. To be honest, it also means I have all my references in sight as well as my Word window. I try to make sure I write comedy at least once a day. This is very grounding and forces me to be a realist about life … or the lack of it. Not all of this works of course, so I often just end up lampooning myself for my own idiocy. Have a nice writing day! I’m so happy to see someone covering this critical issue!!!! Last fall I was gaining weight and decided to do something about. We started going to the gym and I’ve worked my way into resistance training and High Intensity Interval Training, and of course the most imporant part is the diet. Needless to say, I’ve lost 20 lbs and I’m in the best shape of my life as I head into my mid 40’s. For 20 years, I sat way too much. I’ve seen a lot of studies of late on the effects of sitting and I’ve been looking for standing desk. But, I try to get up and move around every 20 minutes or so and I go for walks throughout the day as well. It’s amazing how much sharper and clearer the mind is and how focusing has become easier as well. But I still sit for way to long, glued to my screen. If I weren’t depressed before, after this litany of potential evils…. I used to sit in a chair with my legs crossed for up to 12 hours a day. It caught up to me pretty quickly. The back pain motivated me to start standing up to write for a good portion of my day. I don’t have a standing desk, but I do have a dresser that works pretty well. I would love one of those standing desk/treadmill creations. One day. I also have to wear a tensor on my right wrist to write. It complains loudly if I’m not wearing it. Ooh, cross-legged. Yes, I suppose that would hurt the back. I sit with just my left foot under me far too often. But cross-legged would be pretty bad for long periods. Health issues associated with bloggers/writers/authors have been there but we just ignore them or we choose not to do something about them. Personally, I have experienced backpain, eye strain, wrist pain, obese waist-line, and migraine headache for sitting for a very long time. Since I realized that sitting and writing on a computer screen for a long time could have a detrimental effect on my overall health, I have decided to reduce the time and adjust for the benefit of my health. You are right, Sunday, I did not mention that. And I suppose it is true, especially around the eyes. A very thorough post my friend. Personally, I used to suffer from over indulging at my desk. My desk is situated in my office in my home, so going to the kitchen to get some food and drink was really easy. The horrifying thing was that many a time, I wouldn’t even realise I was eating – I would be busy writing or performing task, and my brain would not realise I was eating. That meant I would over eat. Now, I take proper breaks to eat my meals, and concentrate on that only. I still have water or tea or coffee at my desk, but food is a strict no-no (plus it makes a mess on my desk!). Thanks for highlighting some of the other potential problems. What an epic post! Love what you shared, and completely agree with your points. It’s a good thing I had my son-in-law build me a stand up desk early this year. Had read that sitting is the new smoking, and definitely wanted to reduce my risk for health problems. Eye strain, absolutely. Back ache? You betcha – all things to consider. Will be taking your advice in many areas, and thanks for the share! Wow! this post is very informative. I’ve had some experience with back aches and have has to stand up more often lately. I know this sounds idiotic, but I have an espresso machine near my desk, but not too close. To use it, I have to stand up and walk one pace. It is simple things like that which can just be enough to stop you getting stuck. Of course, I also find wine helps, but recently it has had the strange side effect of me getting a lot of vineyards following my twitter account. Someone trying to tell me something? Oh, yes. That makes sense. My screen is more than two feet from my face. When i felt that my fingers are tired or i becoming fatigue, i take a break by strolling in my room and doing some stretching exercises. I’ll add the eye exercise from this post to my list too. Thanks for this. Wow, I didn’t even knew it was that serious about writers or just sitting down period. I work in IT and I would have to say that I’m lucky to be a field technician. I’m not one of those computer techs that sits down and fix the users problems locally although I have many options to. What I usually do is go from site to site to work on the problems which do give me some time to catch up on reading, commenting and sharing blog posts. I’m also active at the gym and on the dance floor. It’s very true that moving helps to keep you from depression and physical ailments. As a matter of fact, at times my lower back bother’s me, but when I’m out dancing salsa, walking or any type of other exercise it always seem to go away. But if I were to sit for long periods of time, then try to get up the pain comes back. So there is a lot of truth in what you conveying here. Thanks for the heads up on sitting David. This will definitely be a great share! Epoch post! As a blogger or writer, we need to get up and walk around every 50 minutes at least! Hunching over my computer will only give me eye strain. Thankfully I do listen to my body and get up, out of my office and may stare out the window or go for a short walk with the dogs. Yes, I have heard of many of these injuries but not depression. That’s a new one on me! I can see how it can lead to it from reading this. Thanks so much for bringing this to light. Excellent points, David. All writers have been guilty of at least one of these at some point in our writing career. I can see myself in a few of these and know I definitely need to be more active. Yes, I have some of these issues but am finding ways of dealing with them, some of which are mentioned here. I’m an artist as well as a writer and do a lot of detailed screen work with tiny movements. Using a mix of tools helps, I switch between computers and sitting places and between using touchpad and mouse. Vitamin B12 does help partially with the wrist and arm pains. The main thing is I work part time in a job that involves a lot of physical movement, so that helps balance things out. Though I get frustrated at times by being there instead of at my own work, I do realise the benefits of the exercise, and also the social side of teamworking instead of always being a loner at my own work (unless going out to do workshops). I’ve taught myself how to mouse with my left hand as well as my right. This prevents twitching thumbs, but it also helps to keep both hands warm. You are right. Writing, blogging comes with many health risks. However, they can be minimized if we use some simple precautions. But, usually, many newbies are not aware or simply ignore this. Many new bloggers spent hours constantly before their machines, without listening to their body-screams. David thanks for this excellent article.As a hobby blogger writer i work from home and have two cats as a distraction from my desk-top.One thing i am sure is the fact that writers/Bloggers are never ever bored although the work involves isolation from fellow humans.Every profession and career has its hazards and as a former “Marine Engineer” having been employed on ships for over 2 decades did suffer from occupational hazards. “Health is Wealth” this quote tells everything. If you are not fit then you can’t do any work either it’s physical or Mental. Writer sits and write for long hour that cause to sleep disk in future. Thanks for sharing this blog every writer follow your tips. Thanks for sharing all these things that could potentially be signs of health declination. Fatigue is a real thing especially if we are workaholics who attempts to strive more than the regular person. But it’s important to keep our body healthy so we can do our jobs properly. It’s better to work smarter rather than harder. Solitude is definitely a common trait among bloggers and writers. However, it’s a necessity so that they can produce the best output for their target audience. Quality ensures that they keep coming back for your content. It builds trust and loyalty. As a blogger, I’m probably at risk for most things you listed, other than identity loss. Great piece! I knew sitting writing all day wasn’t going to be great for you but I had no idea quite the extent that it can be harmful! I’m glad I’ve got my daily juice to help pick me up and give me a health kick when I need it! Kudos to you from a nurse turned new novelist. I woke this morning wondering if my book was killing me. It may be. Great information. I see the risk factors in lots of my fellow writers. It is a job with many health risks. Your humor is great in the “you might be a writer” also.